Self portrait, selfie, autoportrait, autoselfie. Self portraits are a recurring theme. I have made them in many media such as these I made in Painter in 2002. People post selfies all over. 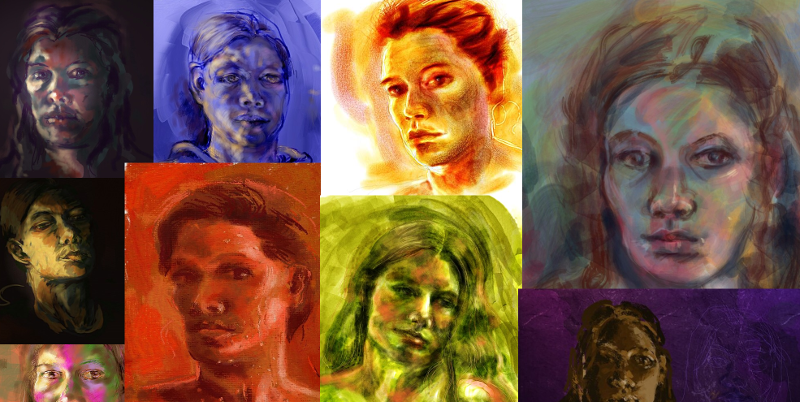 So how can I build something that will allow me to play with self portraits on a code level. My phone can recognise faces, so what do I look like to my phone? Ideas of protecting and revealing identity emerge. The software knows where the eyes are, people hide their eyes or reveal only their eyes. I built #autoselfie the app to explore these ideas. I wanted to play with oauth and I wanted to integrate opencv into an app. The users of the app become the subject of portraits. The software in the app changes the images and posts to twitter. The twitter hastag #autoselfie becomes the place where you can see where all these experiments are collected. OAuth seems simple enough when you read about it but implementing it not without it's tricks. I ended up using a Webview in the app because to use an Intent to break out and do the twitter authorisation in the browser caused backstack complications. I used the twitter4j libraries. I am also using the opencv jars. To do this the app needs the OpenCV Manager companion app. Initially this may be a barrier but it is really convenient not to have to integrate the C++ OpenCV libraries myself, especially since Android Studio does not have NDK support. The user interface design purposefully removes control from the user. In this way the software layers, which normally recede and try to be invisible, are brought to the users' attention. Also the image is posted and the user can only view the result after it has been posted. At this point the user is confronted with the image that has become public and the recognisability of the image to humans and machines alike. In this way the user experience becomes part of the concept of the work. At the moment the app creates images in four flavours. There will be more later. References to these can be seen in the twitter post text and in the code. cannyKonny is a riff off Konny. She sticks large portraits in black and white ink with red highlight on the streets in Paris. Her works are ephemeral: here today stripped away tomorrow. It uses a Canny filter to find the edges and a bitwise not to invert the colours and a splash of algorithmic red. andAnotherOneForLuck is just that, red and pink and yellow are lucky colours some say. noPointInHolding on is the title of a song by Alveol. I found it on a beatoracle playlist.